When people think of electric cars as glorified golf carts, the CitiCar may be what they have in mind. Brought out in the mid-1970s, during the height of the oil crisis, the CitiCar could top 30 mph and had a reliable range of 40 miles  in warm weather. The cars were priced to be competitive with the Volkswagen Beetle, and by 1975, Vanguard-Sebring was somehow the sixth largest automaker in the U.S. 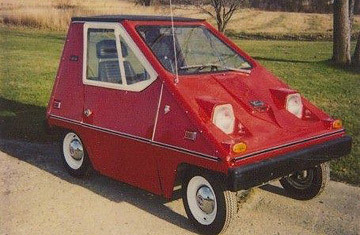 But the tiny, tinny CitiCar suffered due to safety concerns  it had all the crumple resistance of a beer can  and the model didn't outlast the 1970s, where it definitely belonged.